Palm trees and a warm breeze, that's the summer dream, right? 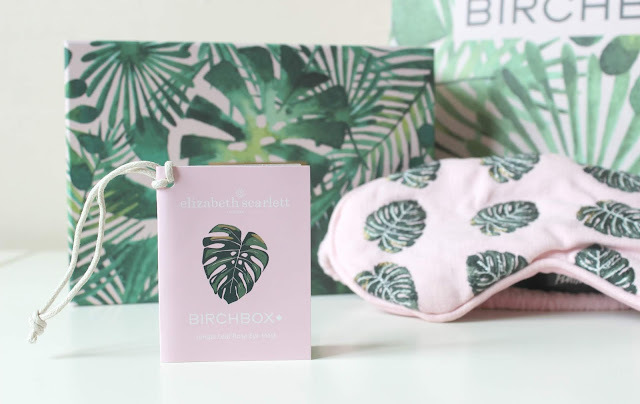 With warmer days and glorious sunshine just around the corner, the May Birchbox is gorgeously themed with a calming palm leaves box design and products which are perfect for that end of spring beauty pamper. 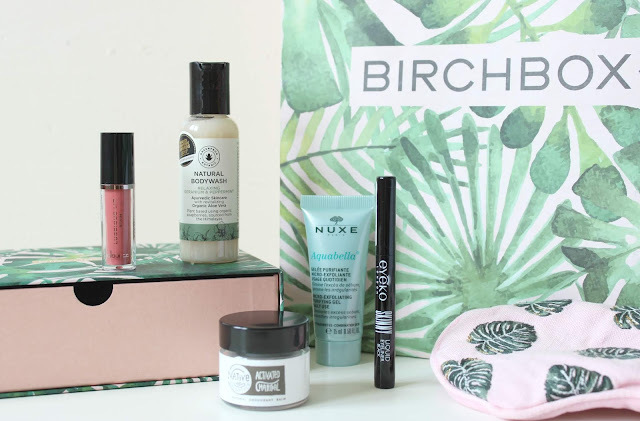 Featuring 5 beauty products and the chance for subscribers to make their May Birchbox extra special, this is one box I couldn't wait to get stuck into. Subscribers will receive one of two shades in their May Birchbox; either Steaming Red or Amber Rose. A pigmented liquid lacquer that applies with a matte finish, it promises to be transfer-free and long-lasting. The shade I received was Amber Rose, which is the most beautiful warm toned rose shade and with a quick-drying formula, it's a lovely shade for keeping in your handbag for on-the-go lipstick application. A travel size of the full-size version, as a liquid lacquer it's set to last a while. Very impressed with this one! With a 50ml travel size, this is going to be perfect for anyone jetting off to warmer climates or indulging in a long weekend away. The scent is incredibly subtle and with an organic, cruelty-free and vegan-friendly formula, it's free from any unnecessary ingredients and bursting with moisturising aloe vera and Saponin-rich soapberries. It works to gently cleanse your skin whilst keeping your pH levels happy and is even suitable for sensitive, eczema and psoriasis prone skin. I'm really intrigued by this product, particularly as I only get on well natural and/or organic deodorants, so I'm hoping I'll get on well with this - not to mention it's a bit of an exciting concept, something new that I haven't tried before! An all-natural cream, it is chemical free, instead opting for sweat-absorbing arrowroot, antibacterial coconut oil and soothing shea butter. To use, you simply smooth a pea-sized amount of the balm between your fingers before applying to clean underarms. This month's box included a 15g sample, so a week or so use to see how I get on with it. I love NUXE products so I was really happy to see a very decently sized 15ml travel sample of this. A gentle but hard-working facial exfoliator, it works to remove dead skin and impurities with a formula that's suitable for use day and night. A huge 85.3% of the ingredients are from natural origin and it's not only free from soap, parabens and sulfates but also has an easily biodegradable formula; the exfoliating elements are natural, so no beads or plastic. I've used this once already and my skin certainly felt smoother after use and a little goes such a long way, so I think this travel size will last me well. Last but not least and a second makeup product with a rather large sample size of one of my favourite liquid liners. It's incredibly easy to use with its brush pen-style nib and the formula is super long-lasting, too, so no smudging or budging throughout the day. Although there are no full-size products in the May box, I do think the sizes of the products included are really great and all will last a while. 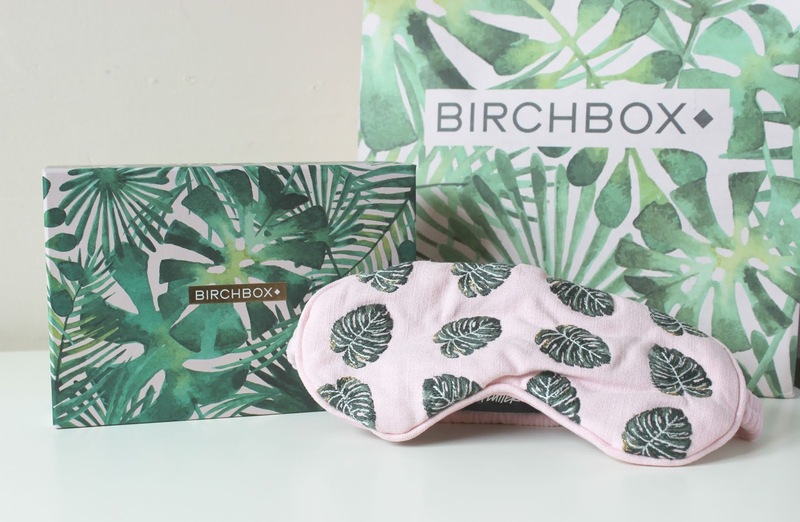 As an added bonus in the May box, subscribers have also had the option to pay an additional £15 to include a limited rose eye mask in collaboration with Elizabeth Scarlett, which is a beautiful addition to the May box and great for an evening of pampering and relaxation. What do you think of the products featured in the May box? Did you receive anything different? Or perhaps this month's box has been enough to sway you into subscribing?